It’s not so good. It should be in Hebrew, but MySpace doesn’t accept Hebrew. It shouldn’t have so much ugly advertising. It shouldn’t use Flash. But for starters, it’s a good way to spread the word. Next in line – stage.co.il and last.fm. http://www.mirontzabari.com will be a bit more complicated but with God’s help will appear one day. Any other suggestions are most welcome. 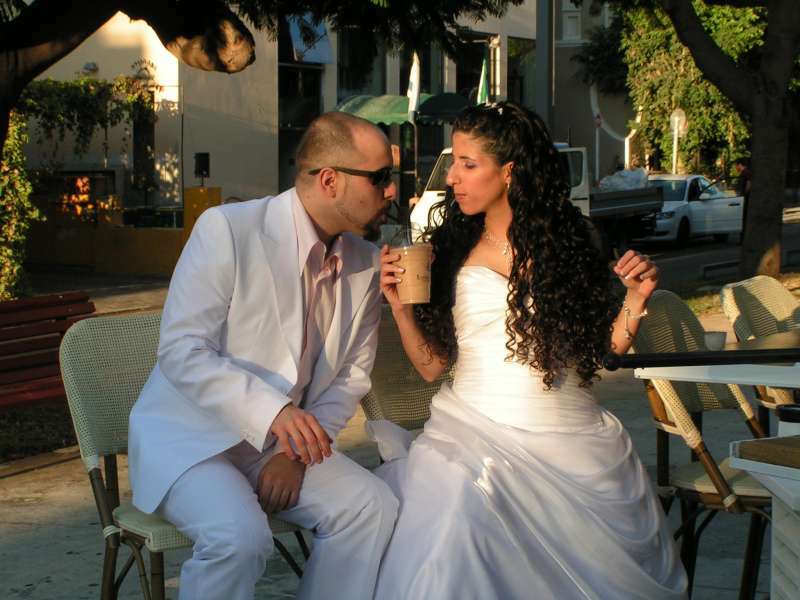 That’s Hadar and me on Rothschild street in Tel-Aviv. Our first date, not including a couple of gigs we’ve seen beforehand, was in a coffee shop nearby. Wedding pictures are coming – as soon as i receive them from the photographer. Stories will come as soon as i write them. In the meantime life goes on and the breaking and wonderful news are that there’s heavy rain in the mountains of Jerusalem. I love rain and i love Israeli winter. I just need to drive really carefully. I thought that Pucca is Japanese and is mostly a character on notebooks, pens and purses for impressionable teen age girls. Apparently she is Korean – she really looks quite different from most Manga. And she has movies too, and they are actually quite good. Look here for some Flesh (sic) animations: Pucca Club (click on “Amusement”). It’s not the first time that i notice that Koreans are better than Japanese at least at some things. It’s like Avis – they try harder. Aharoni is still in Unicode and still alive. Aharoni is also married and one day soon he will write something more here. I forgive everyone everything. I don’t hold grudges and i don’t worry about trouble. Either i can do something about it or i can go to sleep.